My dad is and always has been a fan of airplanes, big and small. For his 65th birthday in May, we bought him a ticket for a ride on Aluminum Overcast, the B-17 operated by the Experimental Aircraft Organization. The ride was to be given from Republic Airport in Farmingdale, New York, just east of JFK International Airport on Long Island. My dad drove down from Maine. I was determined to be there, so I took the Tiger and set out for Farmingdale to meet him. The weather forecasts were not good, but his ride was scheduled for 9:15 a.m. Thunderstorms weren't forecast until after 2 p.m. I thought I could get up early, fly up, be there for his ride, catch a late breakfast, then leave for home well before two o'clock. I was completely wrong. The first part of the flight was beautiful, with just the beginning of the haze that's typical for mid-Atlantic summer days. Northeast past Atlantic City and Philadelphia, I flew over McGuire Air Force Base. Air traffic control called me: "Grumman 28244, your traffic will be a flight of two C-130s." I could see them about to take off on the hazy runway below. I crossed the shoreline just south of Sandy Hook for the 25-mile flight across the water. There was little but gray ahead, but the clouds had a cool dappling effect near the shore. As I flew toward the invisible shore, cargo ships and tankers appeared, ghost-like, out of the haze. I landed, parked the plane, and walked over toward the very obvious B-17 sitting across the ramp. Alas, it turned out that the B-17 was having problems with its landing gear. They thought it might fly in a couple hours, so my dad and I took a guided tour of the museum. I need to go back to this museum someday. It appears staffed largely by volunteers, including several men who flew the airplanes during WWII. They know the airplanes down to the rivet, and it was cool to hear stories about their experiences. My dad and I had lunch, joined by my aunt and cousin who lived nearby. The B-17 was not going to fly, we learned, so I headed for home. It was blazing hot and very hazy. The weather report showed massive thunderstorms covering the route I had taken on my way up. The only way I could get home was to head west into Pennsylvania, then try to head south west of the storms. I had thought of JFK Jr. as I had made the earlier flight across the water, but the conditions were even worse as I headed west. It was VFR weather -- not a cloud in the sky and more than 3 miles visibility -- but there was not a hint of a visible horizon. In the picture below, you can see the shore of Long Beach as it fades, right to left, into invisibility in the haze. There was a period of 8-10 minutes when there was no shore visible through the haze. But for the rippling of the waves I could make out on the water only 1,000 feet directly below me, the world was gray and completely indistinct from horizon to horizon. I was comfortable, but very grateful for my instrument training. I crossed Sandy Point again and headed west toward Princeton, climbing up to 6,500 feet once I was clear of Newark's airspace. Above the haze, there were cumulous clouds all around, and massive thunderstorms in the distance. The haze grew thicker as I headed south, and it felt like I was treading the surface of it. I skirted one huge and dangerous-looking buildup and watched my GPS screen as a line of storms moved across my path ahead. Peering into the haze ahead, I realized that visibility was getting poor enough that I couldn't be certain I wouldn't fly dangerously close to one of the storms in my path. I called air traffic control and told them I was going to divert and land at an airport just ahead because of the storms. "I was just going to talk to you about those storms," the controller said. I spiralled down through the haze and entered downwind for Chester County Airport as a Citation jet took off. The wind on the ground was light, but the winds aloft were quite strong. I didn't like the way the shear affected my lineup on final, so I went around to try again, then landed as thunder rolled in the distance. 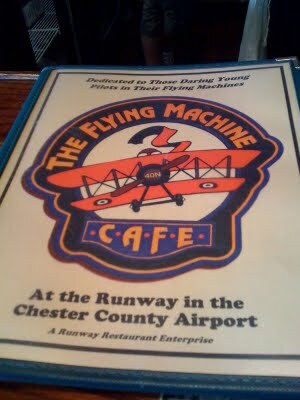 I spent an hour in the Flying Machine cafe, sipping cokes and eating wings, then checked the weather again. The line of storms that had earlier blocked my path was now over Baltimore and southeast of the route I needed to fly. More storms were to the west, but there was a nice opening along my route, so I took off to continue home. My GPS (above) showed more storms moving toward my destination, and my StrikeFinder (below) showed lots of activity on both sides of my flight path, but both devices showed me to be in the clear as long as I flew direct. I kept the power up and booked it for home, admiring the huge anvil clouds in the distance. I landed about 5:00, three hours later than I had hoped. While I had been waiting at Chester County, I had written online that I had made it up to Long Island, but only halfway back. As I drove away from the airport, I got a response from another pilot: "At least you made it somewhere." True enough. The day was definitely one on which technology -- my GPS and StrikeFinder, in particular -- along with some conservative decision-making, triumphed over complex weather. And even though my dad didn't get the B-17 ride he'd been planning for, I got to see him for lunch, which isn't something that happens often since we live 500 miles apart. The trip was worthwhile for that alone. My brother and his family moved to Knoxville, Tennessee. I have to admit I'm a little bit jealous, as I love Knoxville. It also happens to be where my wife grew up, so it's become familiar over the last several years. It's a big change from Maine, and a long way, so my brother and his family needed a place to stay on their way down. Washington, DC, is about half way, so they came and stayed with us. My mom and dad came too, as they were helping with the move. In the end, after two nights at our (2 bedroom) condo, we all headed from Washington, DC, to Knoxville last Sunday. My brother and his family went in one car. My dad drove another car. My mom, Jodie, and I took the Tiger. We had a beautiful flight down to the Knoxville Downtown Island Airport (KDKX). Both Jodie and my mom nodded off and slept while I climbed up to 10,500 feet to get above the clouds, haze, and heat. As we approached the Tri-Cities area, I spiraled down to get under the clouds and we flew the last 45 minutes down the valley. The moving company didn't show up until four days later than promised, so we didn't get to help actually move stuff into the house my brother and his wife are renting. We did, though, get to spend good quality time with my nephews, paint and clean the house, relax with my family and Jodie's, and eat LOTS of watermelon. Jodie flew home by airline on Tuesday night to be at work on Wednesday. I started looking for openings in the weather. While the weather in Knoxville and at home wasn't that bad, it was pretty awful weather in between. Finally it appeared that Thursday afternoon could work. A batch of thunderstorms was moving through Virginia. Worst case, it looked like I could head north into West Virginia, then cut east on the north side of the weather. I took off in 95-degree heat on Thursday afternoon, with a wave to my brother and little nephews who had come to the airport to see me go. Heading northeast, towering cumulus clouds indicative of strong thunderstorms were ahead and to the right of my course. As it happened, though, I never had to deviate because of the clouds and just enjoyed the cloud-scape along my route. One of the requirements to get a Commercial Pilot Certificate is to complete a solo cross-country flight of more than 300 nautical miles. The flight has to take you at least 250 nautical miles from your point of departure, and there have to be at least two landings along the way. It is about 380 nautical miles from Knoxville to Gaithersburg. So for this flight to qualify, all I had to do was land at a couple airports along the way. In southern Virginia, I was passing by an airport that Jodie and I had landed at a year ago in on our first trip in the Tiger: Pulaski (KPSK). As I approached Pulaski from the south, I decided to descend and follow I-81 as it curved around the hills south of Pulaski. I called on the radio to tell them I would be landing, and a soft southern drawl answered that there were no airplanes ahead of me. "And welcome to Pulaski." The man who refueled the airplane, and who had welcomed me over the radio, remembered me from my stop a year ago, and even remembered that Jodie and I had turned back and landed there because of bad weather ahead. After a nice chat and a cup of bad coffee, I took off and headed north for Shenandoah Valley Regional Airport (KSHD). A quick stop at the vending machine for a Zagnut bar, and I continued on, following the Shenandoah Valley north to the airport in Front Royal, Virginia (KFRR). The valley was gorgeous at that time of day, and I stayed low and slow and kept the canopy open to enjoy the cooling air of early evening.